Microscope No. 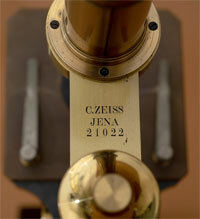 320 is a Zeiss compound microscope signed "C. Zeiss Jena 21022". The serial number is used to date the microscope at the end of the year 1892. The microscope is in very good condition with its original varnish well preserved. It is mechanically and optically in perfect working order. This microscope has a single Zeiss eyepiece, number "3", a Seibert lens number "2", and an unsigned lens number "6" that can be stored in a brass objective cylinder. 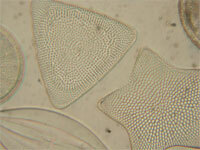 The condenser is of the Abbe-type, with a functional iris. It press-fits into a mount fixed to the bottom of the stage. One flaw is that at the top of the condenser the platinum is oxidized. Focus is by a fine-pitch screw modified by the typical top-shaped thumb control. 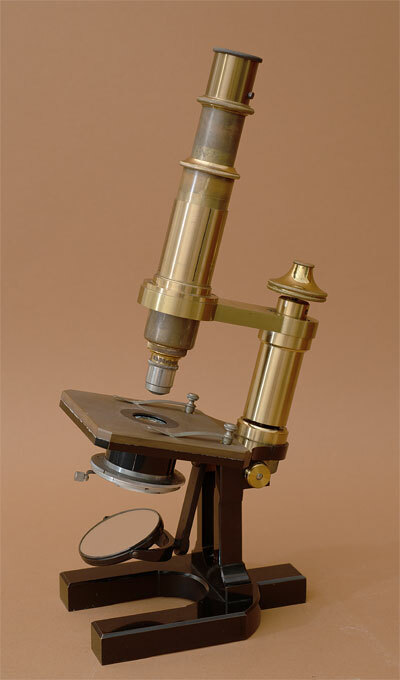 There is no coarse focus; that is accomplished by sliding the microscope body through the brass cantilever mount. The stage is square (9x9cm) and has both slide spring clips. The mirror (dia=4.8cm) is mounted to a descending bar and is mounted to a gimbal. It has two reflecting surfaces: plane and parabolic. The reflecting silver is perfectly intact. The base is horseshoe-shape with two rectangular pillars supporting the compass joint and focus/microscope body mounting structure. Imaging is excellent showing minimal chromatic aberration using either of the two objectives. There are only two accessories with this instrument: a small red box that held 18mm square coverslips (only one remains), and three blank glass microscope slides. The mahogany carrying case is original (38x21x18cm) and has an included key. Mounted to the top of the case is a brass plate from the Belgian Society of Optics and Precision Instrument. This microscope is a beautiful example of the quality and precision that the Carl Zeiss company engineered into their microscope instruments. The content of this website is Copyright © 20032019 The University of California, Berkeley. All rights reserved.